Qumran (Hebrew: חירבת קומראן, Khirbet Qumran) is located on a dry plateau about a mile inland from the northwestern shore of the Dead Sea in the West Bank. The site was constructed sometime during the reign of John Hyrcanus, 134-104 B.C.E. and saw various phases of occupation until Titus and his Roman Legion destroyed it following the fall of Jerusalem in 70 C.E. 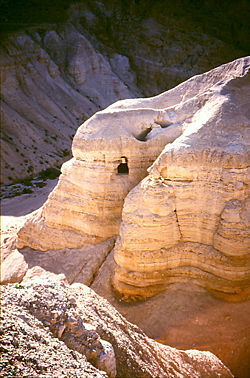 It is best known as the hiding place of the Dead Sea Scrolls, which were discovered in the caves of the desert cliffs. The Dead Sea Scrolls have been lauded as the single most important archaeological discovery of the twentieth century. This high honor comes from the fact that the scrolls provide a treasure chest of information about both Second Temple Judaism and messianic Jewish sectarianism. The scrolls are also tremendously significant for the insights they garner about the theological climate in which Christianity emerged. They show that some Jewish sects at the time (perhaps the Essenes), lived with the clear expectation of the immanent return of the messiah, as well a vivid eschatological picture about the anticipated battle between good and evil. In fact, the scrolls exhibit a great range of beliefs in Judaism, which is reflected in their heterogeneous contents. Since the discovery in 1947 of nearly nine hundred scrolls in various states of completeness, mostly written on parchment, extensive excavations of the settlement have been undertaken. Cisterns, possibly a few Jewish ritual baths, and cemeteries have been found, along with a dining or assembly room and debris from an upper story alleged by some to have been a scriptorium as well as pottery kilns and a tower. Many scholars believe the location to have been home to a Jewish sect, perhaps the Essenes; others have proposed that it was a villa for a wealthy family, or even that it was a Jewish fort and at times a pottery factory. The large cemetery nearby may contain some answers, but this is also disputed. Women were buried there as well as men, suggesting that the site could not have been the home of the celibate Essenes living in the Dead Sea region and described by Pliny the Elder. Some Qumranologists have claimed that the women were buried in separate areas from the men, but this has been shown to be erroneous. Only a small portion of the graves were excavated, because under Jewish law excavating cemeteries is forbidden. Over a thousand bodies are buried at the Qumran cemetery. One theory is that bodies were brought to Qumran because burial was easier there than in rockier surrounding areas. The scrolls were found in a series of caves (eleven caves) just to the west of the settlement. Some have claimed that the caves were permanent libraries with built in shelves, but this is hotly contested. Some of the caves may also have served as accommodations. The texts found in them represent the beliefs and practices of different Jewish religious orientations. 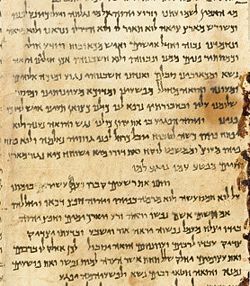 Some scholars continue to believe that some of these texts describe the beliefs of the inhabitants of Qumran, which, according to them, was either the home of the Essenes, or the asylum for supporters of the traditional priestly family of the Zadokites against the Hasmonean priest/kings. A literary epistle published in the 1990s expresses reasons for creating a community, some of which mirror Sadducean arguments in the Talmud. However, most (and according to other scholars, all) of the scrolls seem to have been hidden in the caves only during the turmoil of the First Jewish Revolt, at a time when Jericho and Jerusalem were facing the sack, or had already been sacked, but Qumran was still standing. The Psalms scroll, one of the Dead Sea scrolls. Hebrew transcription included. English translation available here. More recently the theory of Qumran being a religious settlement has garnered critique by some archaeologists who consider the notion very unlikely. In the late 1980s, Robert Donceel, while working on the materials left by the original excavator of Qumran, Roland de Vaux, found artifacts that did not fit the religious settlement model, including glassware and stoneware. Robert Donceel and Pauline Donceel-Voute put forward the Roman villa model in an attempt to explain these artifacts. However, Donceel-Voute's interpretation has been shown wanting because of the lack of other artifacts expected if Qumran were a villa. A recent final publication of the French excavations with the evidence of a decorated frieze, opus sectile, fine columns etc., indicates after all that there existed a phase of a wealthier occupation "une grande maison" at Qumran. According to Jean-Baptiste Humbert, the style of the columns find a parallel at the Tomb of Jason in Jerusalem. While the villa model now seems dubious to some, the evidence that it tried to explain has led to increased scholarly research about the community's primary purpose. Some analysts have suggested that Qumran was a commercial trading center ("entrepot"). For others it was a pottery production center. Portion of a photographic reproduction of the Great Isaiah Scroll, the best preserved of the biblical scrolls found at Qumran. It contains the entire Book of Isaiah in Hebrew, apart from some small damaged parts. This manuscript was probably written by a scribe of the Jewish sect of the Essenes around the second century B.C.E. It is therefore more than a 1,000 years older than the oldest Masoretic manuscripts. Photograph by Ardon Bar Hama, author of original document is unknown. A survey and spatial studies carried out by Finnish and British archaeologists in the area of Qumran in the 1990s supports the theory that the orientations of the settlement and the graves, show that both the settlement and the graves belonged to an intentional planning scheme following the practice of the societies adhering a solar calendar. This scheme suggests that the settlement and its cemetery are connected to the Dead Sea Scrolls and the Essenes. It should be noted that the Dead Sea Scrolls found in the caves nearby the settlement comprise texts that promote a solar calendar instead of a lunar calendar (the Jewish religion follows a lunar calendar established in the rules of the Torah, i.e., the Five Books of Moses). Pottery, glass and coins found at Qumran and along the shore are existing proof of flourishing trade connections in the area, and provide evidence that Qumran did not live in a vacuum in the Graeco-Roman period. Rachel Bar-Nathan (ed. Galor et al. 2006) has shown from similarities between pottery finds at Qumran and at the Herodian winter palaces of Jericho that Qumran should be seen as part of the Jordan valley context rather than as an isolated site. The famous cylindrical "scroll jars" from Qumran, once thought to be unique, she shows to have existed at Masada as well. The several large stepped cisterns that are a feature of Qumran have been viewed as ritual baths by many traditional Qumranologists. This accords with the religious settlement model, although ritual baths have also been found in Jerusalem. There are logistical problems in understanding all these cisterns as baths, however. Qumran's water arrived perhaps twice a year from run off of water brought down by rain. Water was one of Qumran's most valued commodities and water management is an integral part of the site, as seen with the numerous cisterns and channels. If the large cisterns were ritual baths the water would sit getting dirtier through ritual bathing throughout the year and was extremely infrequently replenished by the run off. The current state of analysis of the cisterns is still unresolved, but Katharina Galor suggests a mixed usage of the stepped cisterns as both ritual baths and water storage. According to the Israeli archaeologists Magen and Peleg (ed. Galor et al. 2006), the clay found in the cisterns was used for pottery factory facilities. However, some natural scientists, such as Israeli scholar C. Klein, have put forward evidence which suggests that Qumran was occasionally flooded over the centuries, which could be responsible for aragonite crusting on the walls of the buildings as well as layers of clay accumulation in the structures. The Ecole Biblique archaeologists who originally excavated the site concluded that the settlement served as an Essene site, and many scholars still continue to adhere to this theory. One proposed link between the ruins, the scrolls and the Essenes is the solar calendar contained in some of the scrolls. The alignment of the ruins, according to this view presented above, follows the typical orientations of the societies using a solar calendar. Locus 77, known as a refectory or an assembly hall, in the Qumran settlement, appears to align with the mid-summer solstice sunset (see Humbert in Galor et al. 2006). The "Qumran-Essene theory," similar to the Qumran-sectarian theory, is the theory that Qumran was an Essene site and the Dead Sea Scrolls were collected by the Essenes. However this theory is now heavily disputed by numerous scholars, including Norman Golb at the Oriental Institute of the University of Chicago. Golb, in a paper written in 2007, argued that the efforts of some scholars and museums to continue to justify the Qumran-Essene theory raises serious questions regarding the treatment of archaeological discoveries. In the paper Golb accused adherents to the Qumran-Essene theory of using the press and misleading museum exhibits to promote questionable scientific reasoning and unverifiable claims. Others who dispute the Qumran-Essene theory include the team of Robert Donceel and Pauline Donceel-Voute appointed by the Ecole Biblique to reexamine the findings of Father Roland de Vaux; Israeli archaeologist Yizhar Hirschfeld, who believes the Essenes lived in huts he has located near Ein Geddi; and the officially appointed Israel Antiquities Authority team of archaeologists led by Yitzhak Magen and Yuval Peleg who, after ten seasons of digs, have concluded that Qumran served first as a military fortress and then as pottery factory, and (a conclusion they share with Golb) that the Dead Sea Scrolls are the remnants of libraries taken from the Jerusalem area to the Dead Sea area for safekeeping during the First Revolt. However many scholars continue to believe that a group of primarily disenfranchised priests described in a small portion of the Dead Sea Scrolls could have been Essenes and that they could have established a sectarian community at Qumran. That is the essence of the Qumran-Essene Theory. According to a small number of texts found among the Dead Sea Scrolls that describe this group, its members studied scripture and other sacred texts, as well as meticulously followed Jewish law. The Teacher of Righteousness was identified in these texts as the person who led the community. According to the information given by Philo of Alexandria (see De Vita Contempl. 13), the closest community comparable to the Essenes is the Jewish Therapeutae known to have lived in Graeco-Roman Egypt. Philo describes the customs of the Jewish Therapeutae of Egypt and the Essenes. He describes the penetration of the Egyptian solar adoration and Pythagorean beliefs to the customs of the Jewish Therapeutae, while Josephus tells about the invocation of the sun by the Essenes and the rules not to defile the rays of the deity (visible rays that can only refer to the Sun) when one is doing the private deeds in wilderness. Common doctrines with solar aspirations between the Jewish Therapeutae of Egypt and the Essenes lead to the common roots with the Jews in exile in Egypt, exemplified in the influence of the Egyptian and Pythagorean calendars. It is also to be emphasized that the only comparable communal texts to the Dead Sea Scrolls have been found in the Geniza of the Caraite synagogue in Cairo in Egypt, which according to some may be viewed as another external link indicative of connections with Egypt. The sun dial found in Qumran follows the skaphion type used by the Pythagorean Aristarchos of Samos in Alexandria. Interestingly, Josephus characterizes the Essenes as comparable to the Pythagoreans. One needs to bear in mind that, when the settlement of Qumran dating to the Graeco-Roman period was established, Alexandria was a major city with a number of Jewish residents, and Qumran area was under the rule of the Ptolemies and Seleucids before the Roman occupation. It must be noted, however, that this "Egyptian" theory is disputed by many scholars. ↑ Martin Abegg, Jr., Peter Flint and Eugene Ulrich, The Dead Sea Scrolls Bible: The Oldest Known Bible Translated for the First Time into English (Harper SanFrancisco, 2002, ISBN 0060600640). ↑ Lawrence Schiffman, Biblical Archaeology 58(1), Mr. 1995. ↑ J. E. Zias, "The Cemeteries of Qumran and Celibacy: Confusion Laid to Rest?" DSD 7(2) (2000): 220-252; cf. Norman Golb, Who Wrote the Dead Sea Scrolls? (Touchstone, 1996), 18. ↑ David Stacey, “Some Notes on the Archaeological Context of Qumran in the Light of Recent Publications,” The Bible and Interpretation (BibleInterp.com). Retrieved August 27, 2007. ↑ 5.0 5.1 Robert Donceel and Pauline Donceel-Voute, "The Archaeology of Khirbet Qumran," in M. O. Wise, et al., eds., Methods of Investigation of the Dead Sea Scrolls and the Khirbet Qumran Site: Present Realities and Future Prospects (New York Academy of Sciences, 1998, ISBN 0801860903). ↑ Jodi Magness, The Archaeology of Qumran and the Dead Sea Scrolls (Grand Rapids, MI: Wm. B. Eerdmans Publishing Company, 2003, ISBN 0802826873). ↑ See Minna Lönnqvist and Kenneth Lönnqvist, Archaeology of the Hidden Qumran, The New Paradigm (Helsinki University Press, 2002) and Minna Lönnqvist and Kenneth Lönnqvist, “Spatial Approach to the Ruins of Khirbet Qumran at the Dead Sea,” Institute for Cultural Research, Department of Archaeology, University of Helsinki, Finland, 2004. Retrieved August 27, 2007. ↑ Norman Golb, “The Qumran Essene Theory and recent strategies employed in its defense,” Oriental Institute, University of Chicago (February 2007). Retrieved August 27, 2007. ↑ Yizhar Hirschfeld, "Early Roman Manor Houses in Judea and the Site of Khirbet Qumran," Journal of Near Eastern Studies 57 (1998). ↑ Norman Golb, Who Wrote The Dead Sea Scrolls? : The Search For The Secret Of Qumran (Touchstone, 1996, ISBN 978-0684806921). ↑ Alex P. Jassen, “Religion in the Dead Sea Scrolls,” Religion Compass 1(1) (2007): 1–25. Abstract retrieved August 27, 2007. ↑ Todd S. Beall, Josephus' Description of the Essenes Illustrated by the Dead Sea Scrolls (Cambridge University Press, 2004. ISBN 978-0521609418). ↑ Adolph S. Schutz, The Essenes: A Brief Historical Review of the Origin, Traditions and Principles of the Order (Whitefish, MT: Kessinger Publishing, 2004, ISBN 1417978945), 37. Hirschfeld, Yizhar. "Early Roman Manor Houses in Judea and the Site of Khirbet Qumran." Journal of Near Eastern Studies 57 (1998). Humbert, J.-B. and A. Chambon (eds.). The Excavations of Khirbet Qumran and Ain Feshkha. Translated by Stephen J. Pfann. Göttingen, 2003. Schiffman, Lawrence. Biblical Archaeology 58(1) (March 1995). Zias, J. E. "The Cemeteries of Qumran and Celibacy: Confusion Laid to Rest?" DSD 7.2 (2000): 220-252. All links retrieved June 20, 2015. This page was last modified on 20 June 2015, at 16:48.